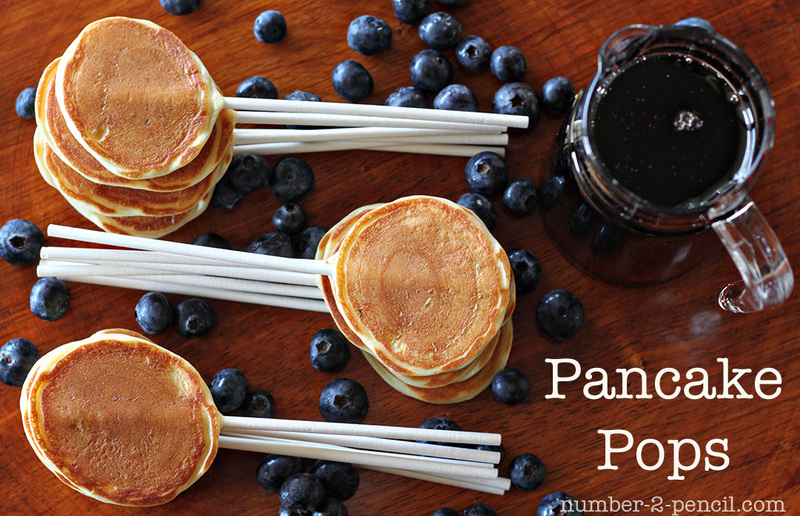 Make Pancake Pops -- perfect for Father's Day Brunch! Hello Tatertots and Jello friends! I’m Melissa from No. 2 Pencil, and I am beyond excited to be here today. Over at No. 2 Pencil, I share everyday recipes and DIY projects with a creative twist. 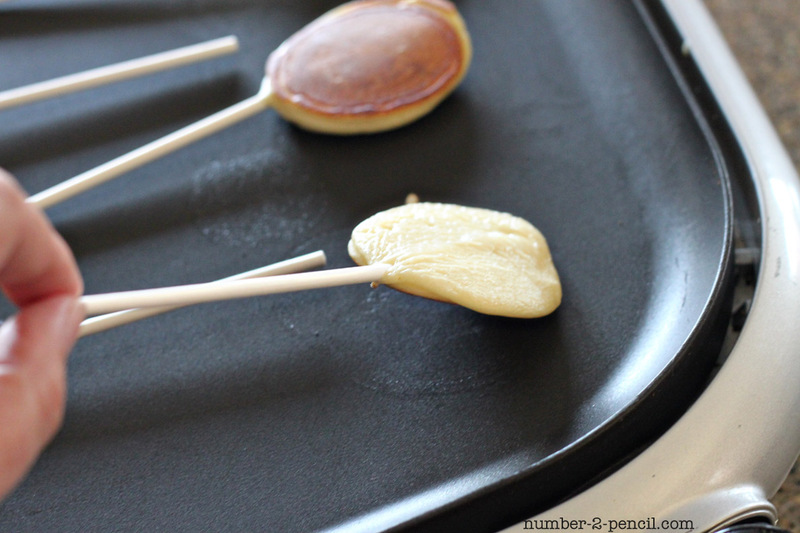 Today, I’m sharing the recipe for these cute little Pancake Pops. 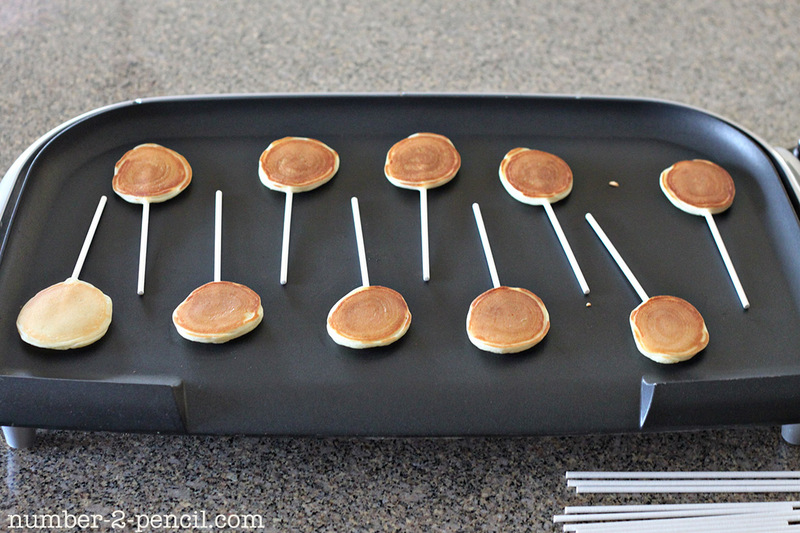 Bite size pancakes, made from scratch using creamy Greek yogurt, cooked on a lollipop stick. My family and I love them and I think you will too! Let me show you how easy and fun they are to make. 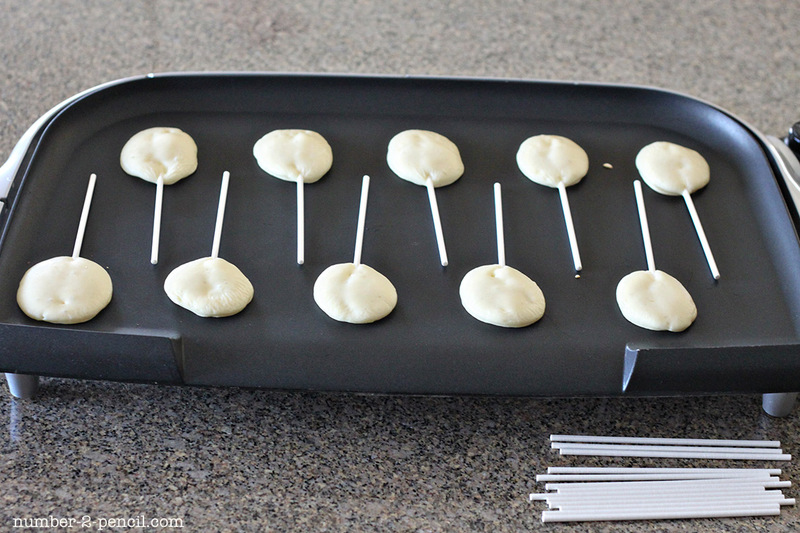 Start by melting your butter, preheating your electric non-stick griddle, and having your lollipop sticks handy. I use the Wilton six inch lollipop sticks purchased from Michaels. Now, let’s make the pancake batter. Add flour, sugar, baking powder, baking soda, and kosher salt to a large bowl and whisk together. Then add non-fat plain greek yogurt, melted and cooled butter, egg, and milk. Stir just until combined. You will have a very thick and creamy pancake batter. Scoop out a heaping teaspoon of pancake batter. Drop the pancake batter onto the hot griddle. Give the pancake about a minute to set up on the griddle side so the lollipop stick won’t go all the way through, then place the lollipop stick in the batter just shy of the top of the pancake. Press stick down and use your spoon to smooth out the valley in the batter, that way you will have pancakes that look perfect on both sides! Space the rest of the pancake pops out, so you have room to add the sticks. They cook really quickly since they are so small. About 4-5 minutes on the first side, and around 3 minutes on the second side. Once the edges start to dry out, they are ready to turn. Oh my, I think this is the cutest batch of pancakes I’ve ever made! 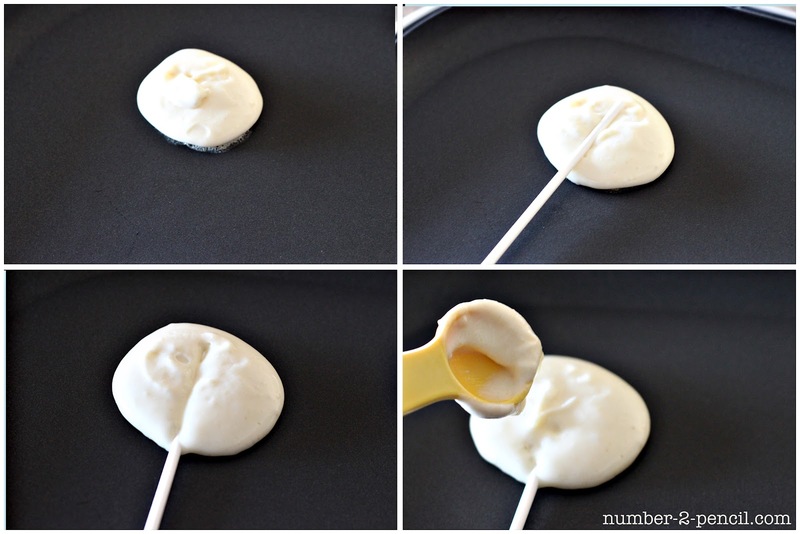 To flip the pancake pops use a small spatula to lift them up a bit, then you can use the lollipop stick to give them a quick turn. The lollipop stick was warm, but it wasn’t too hot to handle. Just be careful not to touch the griddle! 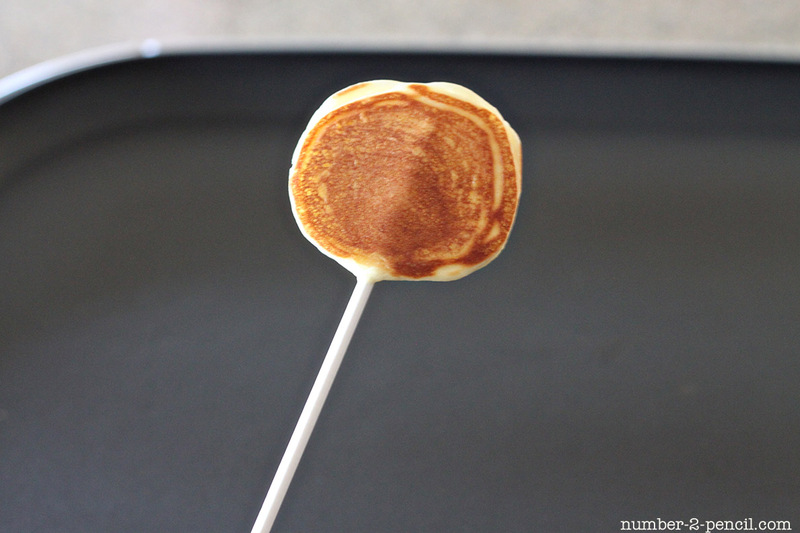 A hot and delicious perfectly cooked pancake pop. 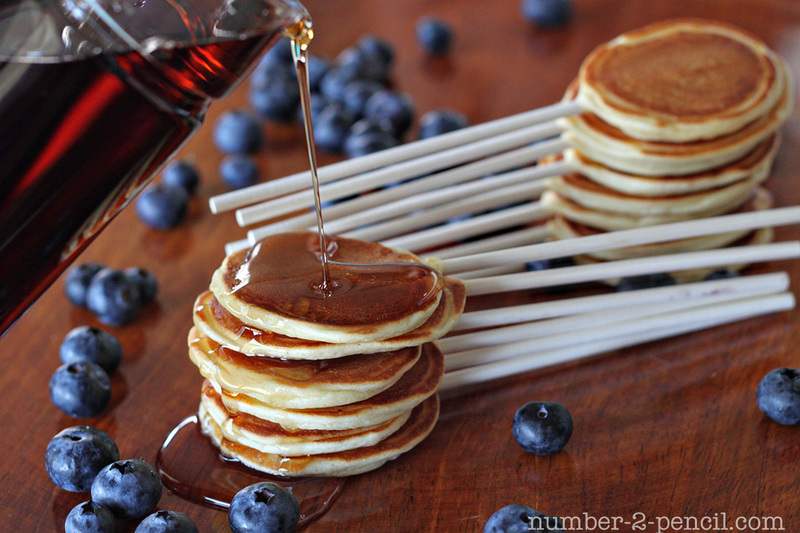 Pile them up on a platter with fresh blueberries and maple syrup, and enjoy! They are delicious fresh off the griddle, or at room temperature dipped in hot maple syrup. This batch cooled off while I was taking pictures, so I popped them in the microwave for thirty seconds and they were perfectly hot and fluffy! 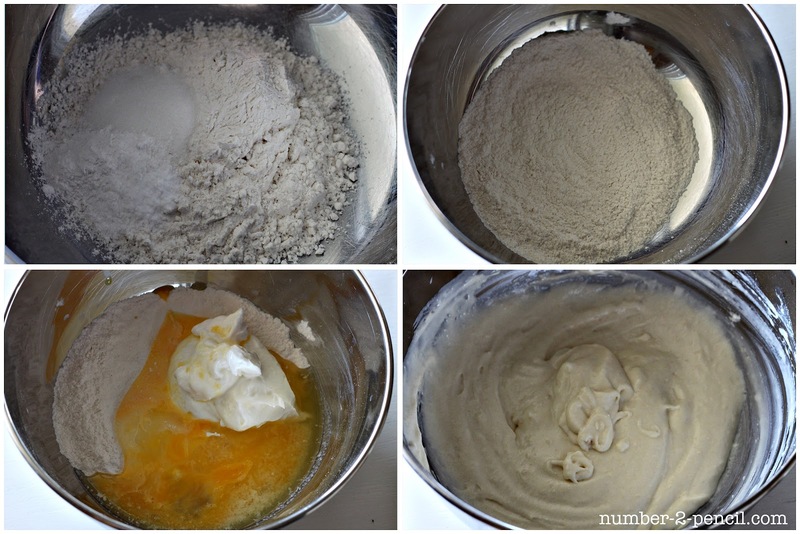 Combine flour, sugar, baking powder, baking soda, and salt in a large bowl and whisk to combine. Add greek yogurt, butter, and lightly beaten egg to the same bowl. 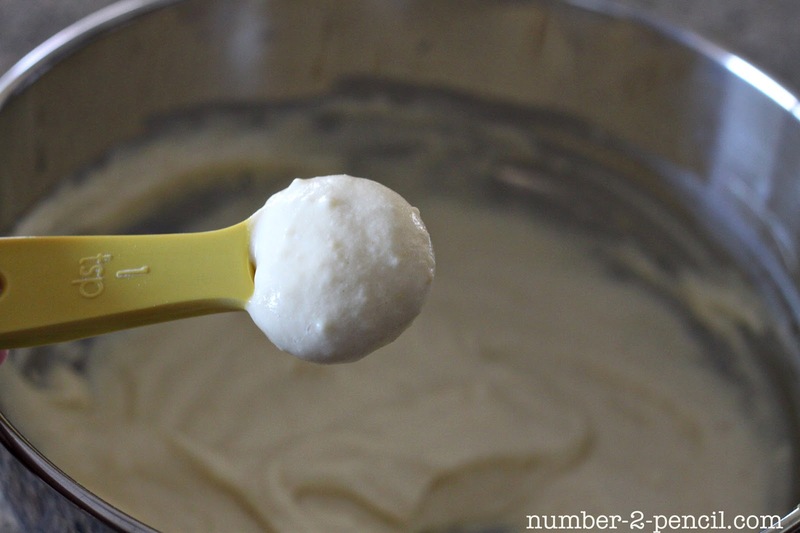 Add enough milk to make batter stir-able, 1-2 tablespoons depending on the thickness of the yogurt. 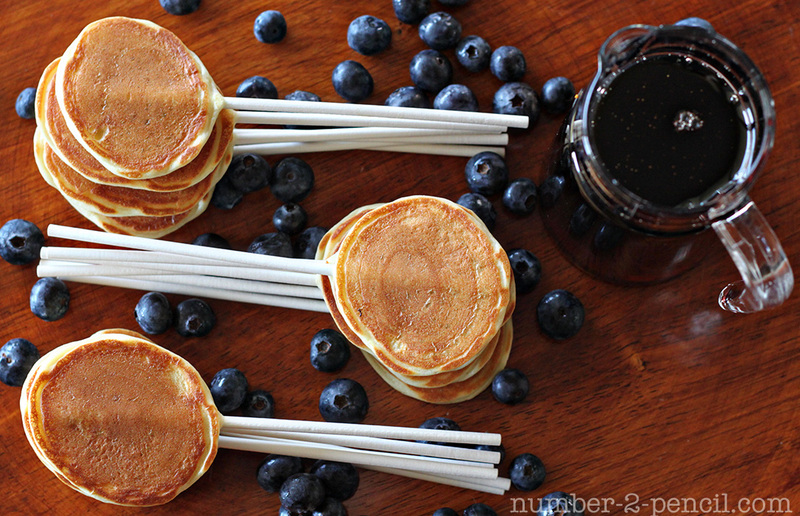 Pancake pops are perfect for a brunch, a shower, or just a fun breakfast for your family. They are really sturdy, so you can even display them standing up, using a piece of craft foam as a base. Kids of all ages will love them! A huge thank you to Jen for letting me share today. By the way, the rumors you have heard are true. Jen really is super nice and super supportive! Thank you so much for having me! Oh my goodness – those are ADORABLE Melissa! What a cute Father’s Day breakfast idea!! Or so fun for a PJ’s and Pancakes Birthday party!!! Or for Fourth Of July Brunch!! No. 2 Pencil Blog is one of the blogs to keep your eye on in 2012. I love it! PS — I am hard at work on my guest room. I have the planked wall painted and caulked now. I have the stenciled rug finished. I made a really fun and whimsical chandelier yesterday. And I almost have the room painted. Now on to the upholstered headboard. I’ll keep you updated on the progress!!! Extra Bonus Summer Giveaway — Win TWO Canon Rebel Cameras! (one for you and one for a friend)! Just made these pancakes. So light, moist and delish, but too delicate for the lollypop sticks. This recipe is a keeper though! Going to be testing these out on my blog soon, love this idea so much! I’ll definitely be sure to give you credit for the idea, so cute. Wow! It was fun of the kids preparing it and I loved it. Thanks so much. These are so adorable! I just love the idea! Amazingly cute idea! Great tie-up to Father’s Day…but kids would love this any day!!! This reminds me, with a great amount of love, of the cartoon from Peanuts where Peppermint Patty introduces her science project as “toast on a stick”. Oh my, how I love this! This is a perfect brunch idea for a bridal brunch I’m hosting. Thanks so much! These are so cute. Perfect and totally awesome. thank you for sharing. 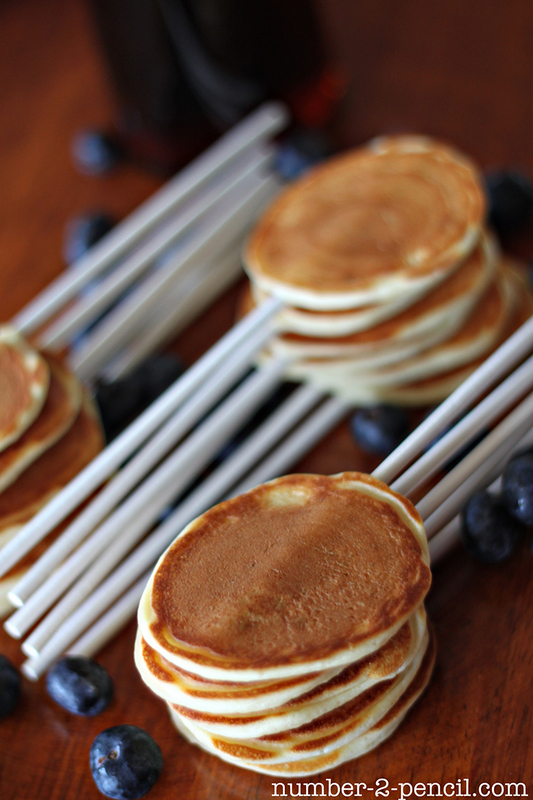 These pancake pops are the best ever – so, so cute! Total magic. Thank you for sharing. Elizabeth from thedotdotblog. My boys would love those!!! Oh my goodness what an AWESOME idea!!!!!!!!! I absolutely love it, how fun!!!! Thanks for sharing this, I’ll definitely try this! Those are so fun! They would be great at a party maybe with some mini chocolate chips mixed it! YUM! I love those pancake pops! How cute would they be for a party?! Jen! Thank you so much for having me!!! I love TT&J, and I am beyond thrilled to be a guest poster!